Hello Forklift Fans! 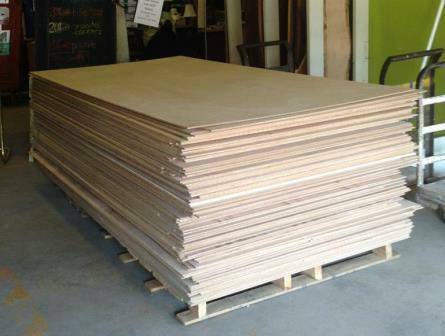 We’ve just received 3 pallets of very nice sheets of maple veneer MDF, great for building cabinets and furniture! 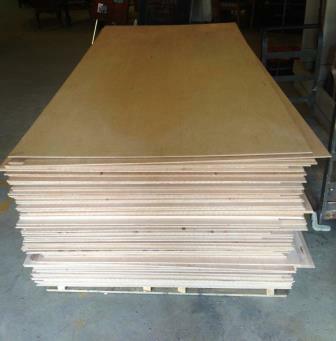 These are top grade 4’x8′ sheets, with a real wood veneer face attached to both sides of the MDF core. An MDF core provides a flat, flawless surface and it’s the most stable (resists warping the best). 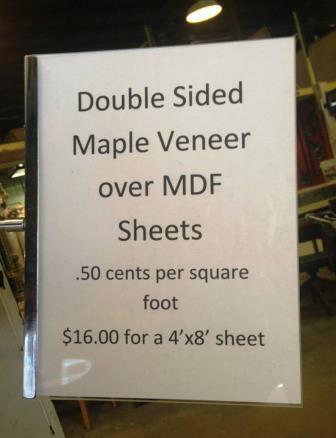 This type of maple veneer MDF usually retails from $45-$77 a sheet. Our sheets were lightly used (in a maze at the National Building Museum! ), so we are offering them for just $16 each. If you are interested, you need to come look at the wood yourself! Nice sheets of plywood and MDF tend to go very quickly here – so you can call us, but our Reuse Associates may not know what we have left in stock (it’s like calling Goodwill during a half-price sale to ask how many shirts they have). We’re not able to do holds over the phone, and we cannot take your credit card over the phone. So you’ve got to come visit right away if you’re interested! After you buy them, you have a week to pick them up. We offer a free storage service – so after you purchase bulky items, you have a week to find a truck, and to round up friends to help you load. When you are ready to take them home, you must arrive at least 30 minutes before closing time so you have enough time to load. We’re open Saturdays and Sundays from 9-6, Mondays-Fridays from 10-6 (and an hour later on Wednesdays, from 10-7pm).